Amazon today announced the 16 finalists in its third-annual Amazon Robotics Challenge. The teams from Australia, Germany, India, Israel, Japan, the Netherlands, the Republic of Singapore, Spain, Taiwan and the United States will convene on July 27 in Nagoya, Japan, where they will demonstrate their latest robotics hardware and software that can pick and stow items in storage. The Challenge combines object recognition, pose recognition, grasp planning, compliant manipulation, motion planning, task planning, task execution, and error detection and recovery. 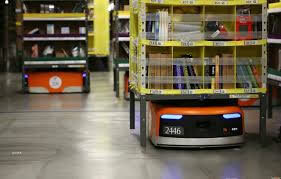 The robots will be scored by how many items are successfully picked and stowed in a fixed amount of time. Winning teams will be awarded up to $250,000 in prizes. "This challenge is an opportunity to strengthen the ties between the industrial and academic robotic communities and promote shared and open solutions to the technical challenges we face in unstructured automation," said Joey Durham, Contest Chairperson and Manager of Research and Advanced Development for Amazon Robotics. "It's also a celebration of robotic innovation - something we are deeply focused on at Amazon - and provides a platform for the academic and research community to share and promote their research in a fun and rewarding way." This year's Amazon Robotics Challenge will be held during RoboCup, the leading and most diverse competition for intelligent robots and one of the world's most important technology events in research and training. The 2016 contest was held at RoboCup in Leipzig, Germany, and was won by team Delft, a collaboration between Delft Robotics and TU Delft's Robotics Institute. "As a result of this contest, we are attracting more interest than ever before from robot manufacturers approaching us to pursue additional research," said Carlos Hernandez Corbato, Team Delft Captain and Postdoctoral Researcher. "This challenge was the most exciting project I have ever done in research and the most gratifying because of how much we learned." Amazon is committed to supporting innovation in robotics and automation. The company utilizes a wide range of innovative technology within its fulfillment centers, including more than 80,000 Amazon Robotics drive units in over 25 fulfillment centers worldwide. Amazon Robotics drive units deliver items directly to employees at ergonomic work stations and help make associates' roles more efficient. For additional information about the Amazon Robotics Challenge including contest details, participating teams, rules, and FAQs, visit www.amazonrobotics.com/#/pickingchallenge. For more information about RoboCup, visit www.robocup2017.org.